You can add emphasis to selected cells in an Excel 2010 worksheet by changing the fill color or applying a pattern or gradient effect to the cells. If you’re using a black-and-white printer, restrict your color choices to light gray in the color palette and use a simple pattern for cells that contain text so that the text remains legible. On the Home tab, in the Font group, click the Fill Color button’s drop-down menu. The Fill Color palette appears. 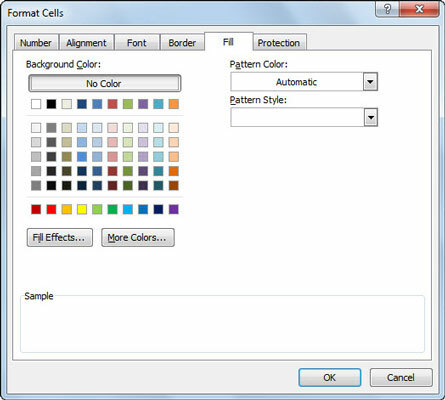 Use the Fill Color button to choose a solid background color to add to selected cells. Select the color you want to use in the drop-down palette. 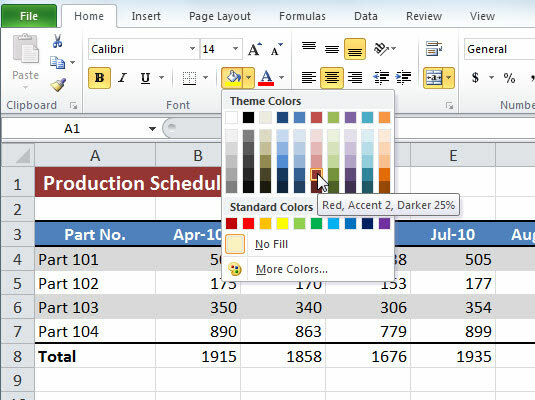 Excel’s Live Preview lets you see what the cell selection looks like in a particular fill color when you move the mouse pointer over the color swatches before you click the desired color. Click the Font dialog box launcher on the Home tab (or press Ctrl+1). The Font dialog box launcher is the small icon in the bottom-right corner of the Font group. The Format Cells dialog box appears. Select a new pattern for a cell selection on the Fill tab of the Format Cells dialog box. Click a pattern swatch from the Pattern Style button’s drop-down menu. Click a pattern color from the Pattern Color button’s drop-down palette. The Sample box displays the selected pattern and color. (Optional) To add a fill color to the background of the pattern, click its color swatch in the Background Color section. Press Ctrl+1 to open the Format Cells dialog box and then click the Fill tab. Click the Fill Effects button. The Fill Effects dialog box appears, with controls that enable you to define the two colors to use, as well as shading style and variant. Use the Fill Effects dialog box to apply a gradient effect to selected cells. Select the two colors you want to use in the Colors section. 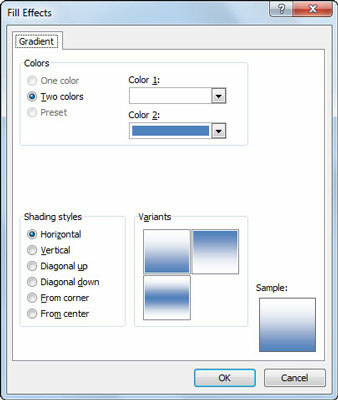 Select one of the Shading Styles options to choose the type of gradient pattern you want to use; then click the variant that you want to use. The Sample box displays the current selections. Click OK two times to close both dialog boxes. You can remove fill colors, patterns, and gradients assigned to a cell selection by clicking the No Fill option on the Fill Color button’s drop-down menu on the Home tab.